To say I was distraught is a massive understatement. This situation forced me to think not only about the blog, but also about my writing and my reading habits. 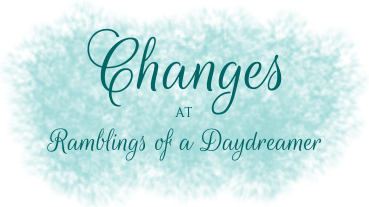 At the end of last year, I debated whether to continue with Ramblings of a Daydreamer. Readership was low, and I got next to no comments, even if a blog post had a ton of views. I wondered if I was wasting my time, but I decided to give it one last shot, and I ended up enjoying blogging for the first six months of 2017. Now, though...it’s not that I no longer enjoy it, it’s just that I realize it’s time to make some changes. For the last several years, at least 3/4 of the books I've read have been review books. I feel incredibly fortunate to have had access to so many ARCs directly through publishers and through sites like Edelweiss and Netgalley. I’ve loved working with authors as well, and have discovered some of my favourite books because I’ve been given the opportunity to read the books for free in exchange for honest consideration. But it’s time consuming. And it can be stressful. It’s left me wishing for more time to read the books I want to read that don’t have deadlines for reviews. Some of the dozens and dozens of books I’ve bought/won/been gifted over the years that sit forlornly on my shelf, getting very little attention unless it’s to photograph them. Then there’s my author blog. Ohhh, my poor, pathetic, neglected author blog. I never posted there regularly, but my last post was over two years ago! *cringes* I’ve kept the book info up to date, but haven’t made any effort to post there, and now I have the same problem of it looking like a mess thanks to PB. So I’ve come to a decision. I’m going to slowly transition Ramblings of a Daydreamer into a more general blog. Occasional book reviews and bookish posts like lists, discussions, maybe even a meme here and there. I’m planning to focus more on promoting the books and authors I love rather than reviewing every single book I read whether I loved or hated it. That will take a massive amount of stress and pressure off my shoulders and free up more time for writing and reading. More posts about writing - my own (updates, teasers, etc) and in general (tips, advice, self-publishing info, etc). More personal posts. Stuff that's going on in my life, things I like, maybe even a few photo essays thrown in. I've gone through several pages of posts, fixing them with new pictures. The only good thing about this happening is that I've always wished my graphics were the same size, and now I can redo them so everything is uniform and looks more professional. It would take me forever to do the entire blog, so I'm not even going to make that a goal. I hate that some of it will always look horrible and have blank spaces, but there's no way I can go through 1000+ posts and redo them all. I've also designed a brand new header, and I'm in the process of redoing and streamlining all my pages. This way, I won’t be giving up a blog I’ve worked hard on for 7 years. I also won’t feel as much pressure to write reviews and read a gazillion ARCs (which is largely my own fault; I’ve been saying for years I was going to cut back and I never do). Plus I won’t feel as bad about my neglected author blog because Ramblings of a Daydreamer will be an all-in-one deal. I’m aware I might lose followers through this transition, but that’s a risk I’m willing to take. I want to love this blog and be passionate about it and proud of it. I’m hoping readers, both old and new, will follow along and be more willing to engage (I know I need to do my part and start commenting more on other people's blogs). Numbers don’t mean anything when no one is reading or commenting on your posts. I want to help and inspire as well as entertain, and I’ll do my best to do all of that and more. Thank you to those who stick with me through this new adventure. I'm always around, even if I'm not a vocal presence. Good luck with your changes, they sound great! And sorry to hear about the Photobucket mess, that's awful. I've seen a lot of bloggers struggling with that and it's really awful to have them plaster that message on everyone's blogs! Thank you! It's been such a pain. Another blogger told me she was deleting all her images from Photobucket so there'd just be a blank space where the images were. I tried that too, but PB's ugly notices are still all over my blog, so it's doubly frustrating! Your new header is so pretty! I love it.